May 12, 2018 – The Dow Jones industrial average rose on Friday as Wall Street booked a week of solid gains following a strong rally in energy stocks. The Dow also posted a seven-day winning streak. The 30-stock index closed 91.64 points higher at 24,831.17 with Verizon and Merck as the best-performing stocks. Meanwhile, the S&P 500 gained 0.2 percent to close at 2,727.72 as telecommunications and health care outperforming. The NASDAQ composite closed just below breakeven at 7,402.88. For the week, the Dow rose 2.3 percent — its biggest weekly gain since March — while the S&P 500 and NASDAQ climbed 2.4 percent and 2.7 percent. Energy stocks led the way for the major indexes this week, climbing 3.8 percent. The sector received a boost from surging oil prices, which jumped after the United States pulled out of the Iran nuclear deal. Bull market (dark green over red) the dark green 50-day average is in a sideways trend. Notice the second window, the slope is negative but improving. BULLISH Bull market -- expect bullish outcomes. Swing Traders: Remain aggressive. The path of least resistance is up. (You might ignore this signal until chart 103 improves longer). Slow commodity lift, gold is weak under this strong market and rising dollar (could bounce back here). 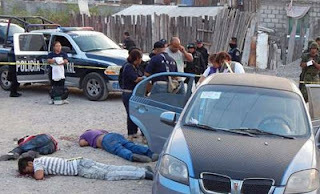 Violence has surged across Mexico over the last decade after former president Felipe Calderon's government declared war against the country's powerful drug cartels in late 2006. In November 2017 alone, 2,212 murders were recorded, while 2,380 killings were carried out in October, making it the most violent month since the authorities began keeping records two decades ago. Some 190,000 people have died in drug-related violence since then. Here is a list of the most dangerous cities in the world -- most are in Mexico. As I pointed out in "Why I Believe in America" the U.S. is not a single nation, it really is more like 50. 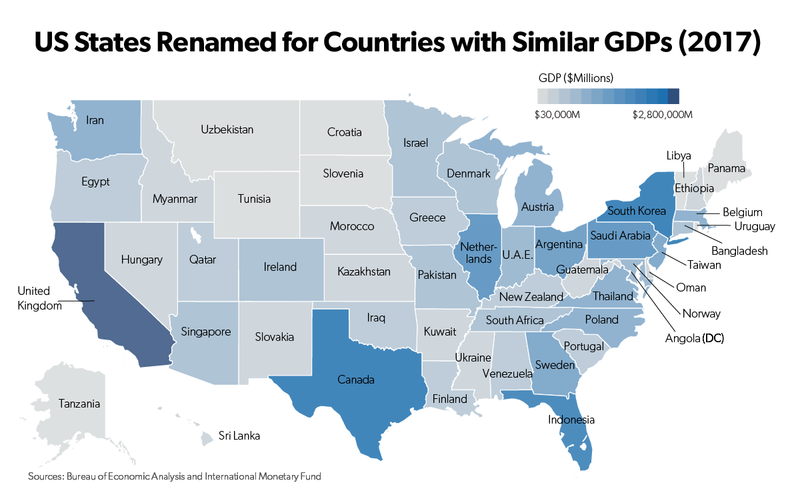 Here is a map with the U.S. states renamed after nations with similar GDP. For example, Texas is the same as Canada economically speaking, just with worse eating habits. Oil is doing very well these days . . . If you want to put a segment of your funds outside of US let's look at some top performing nation based ETFs. Here are my picks for May, hold until month end. I think we are in a near record long, secular bull market (since early-2009). As I said last week, the rally last Friday was impressive and it carried through with upward momentum this week. Breadth is getting stronger and we look like we are breaking out of our consolidating triangle to the upside. 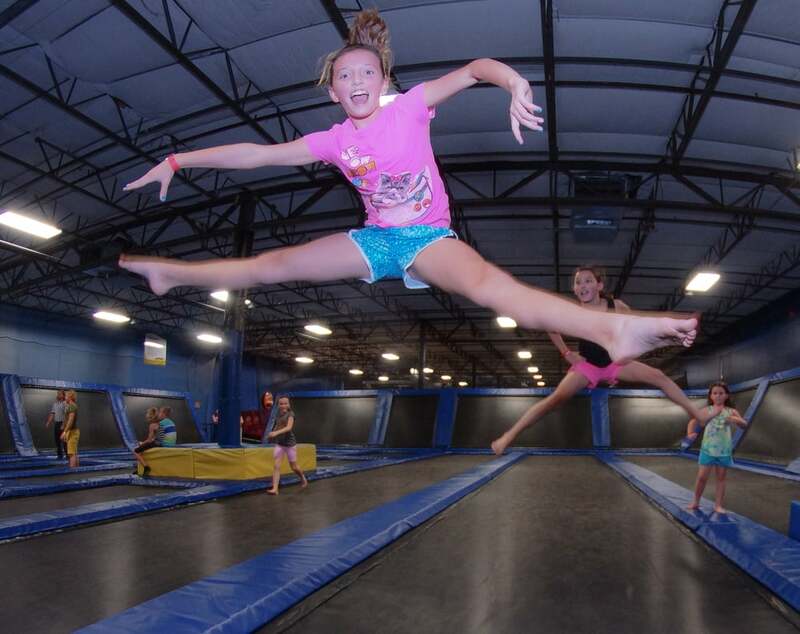 Stocks had a very good week. Major U.S. stock indexes had their best week in two months, with all of them gaining more than 2%. Small caps and the NASDAQ led the market higher. The S&P 600 Small Cap Index hit a record high, while the Russsell 2000 isn't far behind. The new high in March for the NASDAQ is bullish and high techs -- leading in May. Both Internet and Semiconductor stocks are doing very well. It is also interesting that after a long sleep Biotech is getting a boost. Also this market is turning point as the equal weight S&P 500 ETF (Ticker: RSP) is outperforming the Cap-weight version (Ticker: SPY). As I said before Canadian stocks are performing better than they have for some time. Despite well-known predictions of gloom -- Canada has a strong financial system and the economy is doing well as trillions have flowed into the world's most passive real estate money laundering hot spot. The new favorite is Montreal. Canada's economy is tied to oil. U.S. benchmark crude-oil has soared steadily to its highest level since November of 2014, breaking above a level at $71 a barrel. Although a rapid burst up in crude could have knock-on effects for average consumers, driving inflation and prices higher, Californians are now paying $3 a U.S. Gallon for gasoline (.80 cents a ltr), whereas in Vancouver it is almost $4.60 a U.S. Gallon ($1.21 a ltr.) (All price in U.S. currency). But for the market, they are helping to deliver a jolt to Canada's energy sector that was all but forgotten last year. Two previously mentioned stock picks, Canfor forest products and Methanex Corp. are up strongly. Some other old favorites are Pembina Pipeline, Bombardier, C.P rail and TD Bank. TD wisely has curtailed its mortgage lending business by shifting risk to second-tier lenders. I also think refiner Parkland Industries should benefit from the current conditions. It is a bull market - expect bullish outcomes -- as this week showed that can always surprise to the upside. Although this was an impressive rally, we will need to stay above that "correction triangle" to keep upward momentum. The VIX has dropped a lot this week, but my measure of volatility, the ATR of the weekly market is still in a high range so I expect more bumps ahead. It has only been a week since we had some real issues with breadth. Also on the Bull Bear lines, our 50-day slope is still technically negative. Much euphoria is based on the statistics that say inflation is in check. Well that is nice, but with oil prices rising how long will that hold? Inflation or rate hikes are coming sooner or later, J.P. Morgan thinks 4% is coming. The market is expensive and debt levels are high, so don't celebrate too quickly. Remain positive, but I would not expect next week to be up strongly, but who knows.